The owner of a set of caves in North Yorkshire says he has had "tremendous interest" from people who want to buy his tourist attraction. Gordon Hanley's family have owned Stump Cross Caverns near Pateley Bridge since 1926 when they paid £400 for them. They have developed the caves into a business that attracts 60,000 visitors a year and is now on the market for offers over £675,000. Mr Hanley told BBC News Online: "We've had tremendous interest, including one or two inquiries from abroad, as well as from local businessmen and some from London. "We're just waiting to see what happens." For their money, the buyers will get a set of caves dating back 500,000 years and cover an area of four square miles. 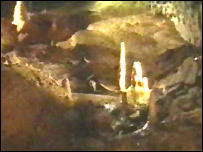 The caverns were discovered in 1858 by miners looking for lead. 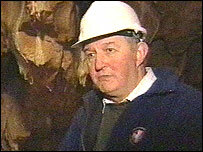 Mr Hanley, 58, has been involved with the caves since the age of 12 and says it is time to retire along with his wife Sue. "My two sons both have their own careers," he said. "So we intend to travel the world and look at a few caves, perhaps in Australia or New Zealand." Any buyer will also be taking on a decades-old mystery. Somewhere in the caves there is a hidden entrance to an underground lake which was found by a local potholer in the 1920s. He told the owners he would tell them where it was if they gave him a share of the profits. When they refused he concealed the entrance and no one has found it since.